Mary Grisey is a Toronto-based fiber and installation artist whose work echoes the poetry of ancient Greek mythology. 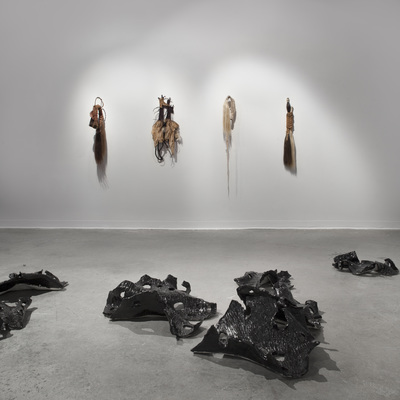 Her work deals with the transformation of ephemeral materials and illustrates the inevitable toll of decay on a massive scale. She created META, a line of hand-crafted jewelry that employs ancient techniques such as weaving, braiding, natural dyeing and clay building. How do we understand, connect with and react to traces of the metaphysical? 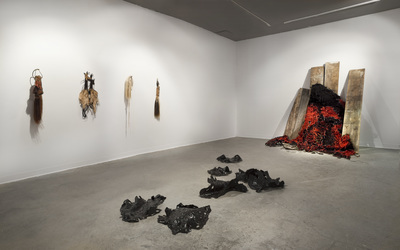 My work is about becoming, a process that encompasses both doing and undoing; energy goes into my materials and then there is a natural or simulated process of destruction. Transformation is central to my practice: a metamorphosis that reveals the ruin and beauty of both the body and the psyche. I am fascinated by the connection between the physical and metaphysical, and, in this vein, I take ancient mythology, metamorphosis, ruination and entropy as inspirations in my work. Like ruins, my installations are remnants of what was once whole; they are inscribed with traces of their previous life, death endured and the hereafter. My works embody these remnants that prefigure thought and feeling. In your statement you say that your work is about connecting with traces of the metaphysical? How so? What is your conception of “the metaphysical”? The Greek prefix, “meta”, in the word metaphysical means “beyond” or “after”, and I am interested in what is beyond the physical. I use “metaphysical” as an umbrella term when describing my work, but I could also say my work is spiritual, mystical, otherworldly or transcendental. By metaphysical I mean that I am interested in that which is “beyond” what science can measure. 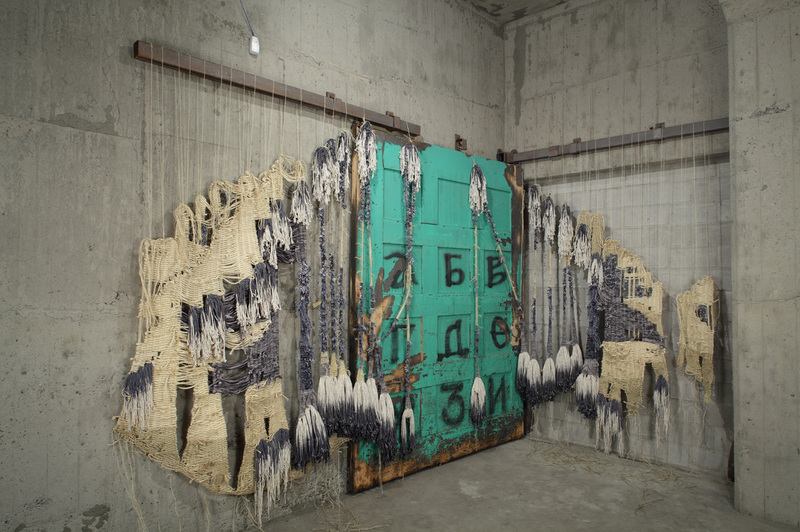 One could say that my woven installations are haunted spaces where emotional manifestations exist. These emotional manifestations exist as “auras” that stick to, and emanate from, certain objects or spaces with a nonmaterial presence or emotional residue. It is a residue that prefigures thoughts and is transmitted from the “aura” to the viewer. It is not visible but is felt. "My intention is to transport the viewer into an imaginary space where their senses are amplified by my visual and auditory work. 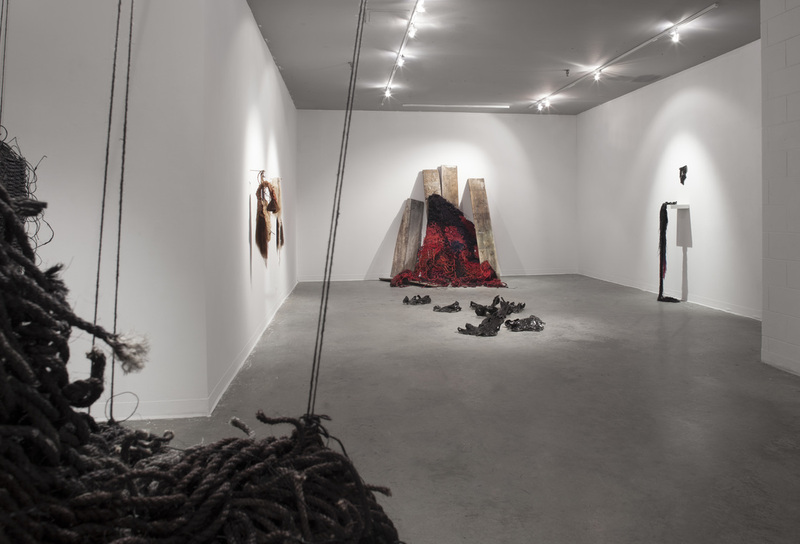 One can navigate around the work and interact with it, which can create a sort of narrative on its own." You also state that your work is influenced by ancient mythology. Judging by the titles I'm assuming some of your pieces refer to specific narratives. What myths in particular have influenced your work? Can you give us a few examples? Yes, a few of my works have been influenced by Greek mythology. 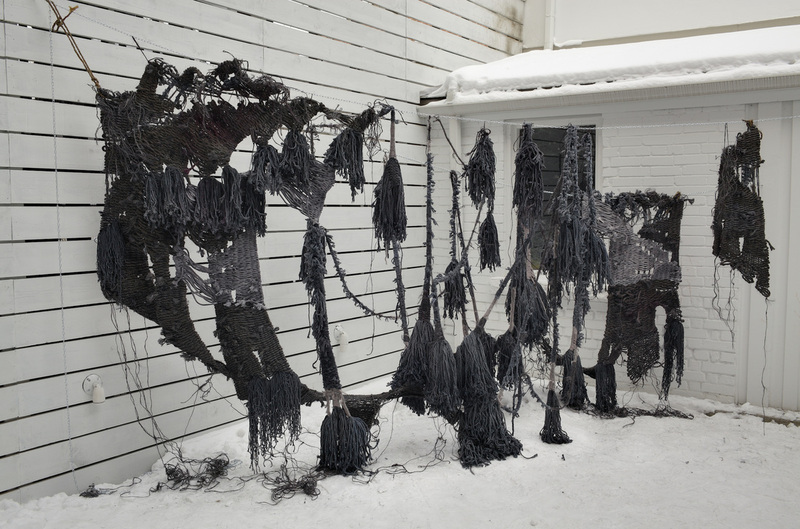 My woven installation, For Lethe, refers to the “river of forgetfulness”, which before those in the underworld can reincarnate, they must bathe in the river Lethe so they will forget everything that they have seen. 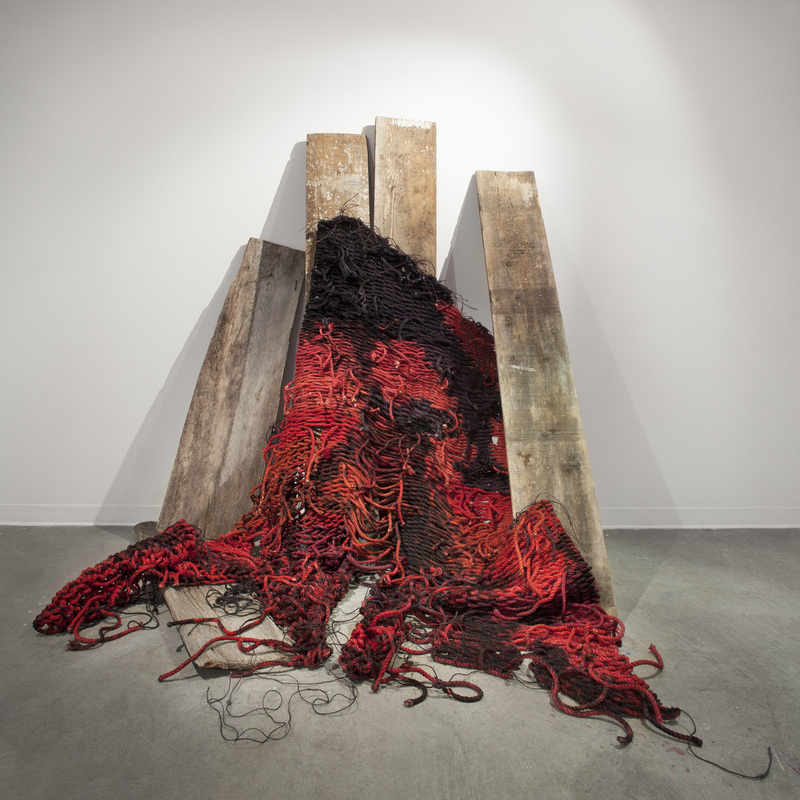 The weaving itself reminded me of a ruin that has been pulled up from the depths and unconcealed, and presents a space where the viewer can discover the “truth” that has been revealed inside the woven ruins of For Lethe. Other works such as Relic of the Moirai and Study of Er point to my interest in the ephemeral body and spirituality. The Relic of the Moirai references the three fates: Clotho, Lachesis, Atropos. These three women were thought to have controlled the “thread” of every mortal life from birth to death. When I was making this work, I wove a pattern and then unraveled parts of it in reference to a metaphor for controlling the threads of life. The Study of Er was inspired by my interest in Plato’s Myth of Er. In this myth, a soldier named Er dies in battle and continues on into the afterlife, though he is eventually brought back to life to tell the living what he had seen and heard. For this work I cast my whole body in plaster and clay and wrapped the cast in a handwoven linen shroud. The hollow body references the remains of the physical and what is left behind when we die, and the question of where the spirit or soul goes. 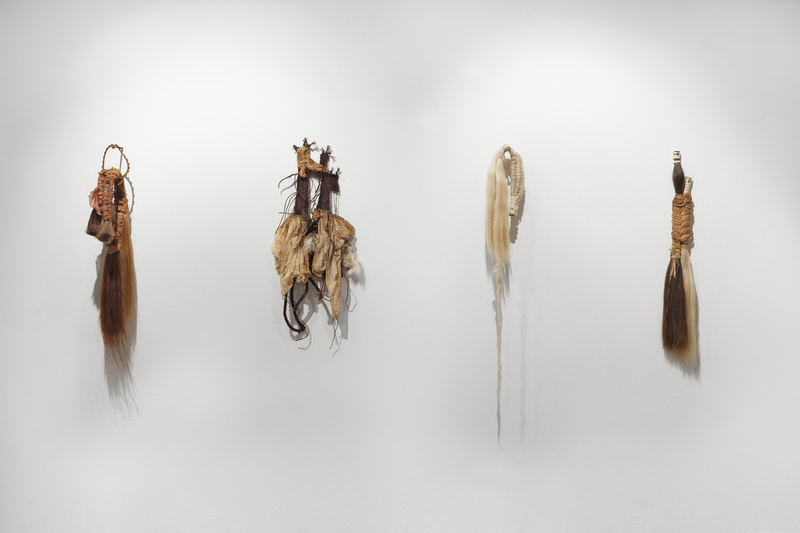 "I often choose materials such as hair, fur, cheesecloth, cotton, sisal, dyes and rubber latex because they can be used to suggest the body in its primal state of being. " I have installed work in diverse venues: a grungy warehouse space, outdoors, a department store, an old hotel, a pristine gallery, etc. I can find magic wherever I decide to install my work because I’m always considering the site-specificity. When I’m making the work in my studio, the work is never finalized there. 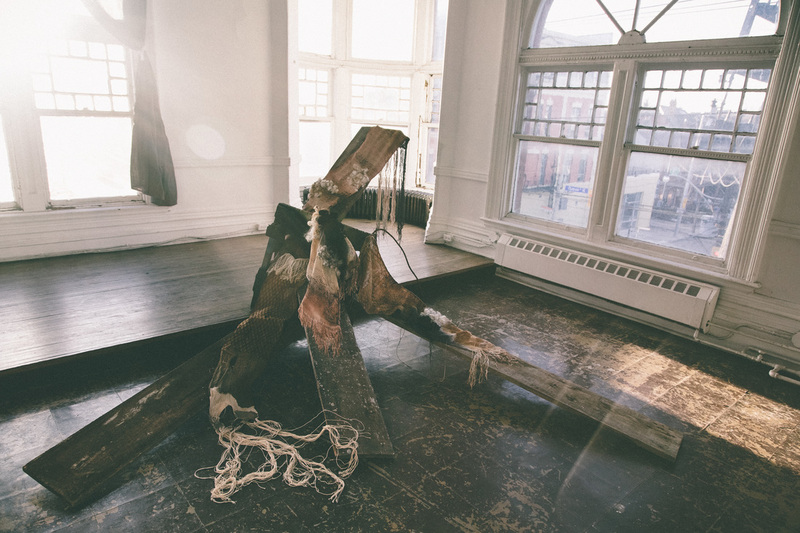 It’s when I get to the installation space to arrange the work—everything that was preconceived could change. I really embrace the “feeling” of the space. I actually enjoy installing in a white-walled gallery. It gives me a blank slate to work with and makes the work really shine. Your sentiment is on point: “Your works are quite monumental and sometimes seem as if they have been plucked out of some great tale and placed in a gallery space.” My intention is to transport the viewer into an imaginary space where their senses are amplified by my visual and auditory work. One can navigate around the work and interact with it, which can create a sort of narrative on its own. The materials you choose have such a weight on the overall aesthetic of your work. And it seems that they have to have an almost visceral connection with the body - connecting not only with our eyes but with our other senses as well. What goes into the process of sourcing your materials? The process is really intuitive. I often choose materials such as hair, fur, cheesecloth, cotton, sisal, dyes and rubber latex because they can be used to suggest the body in its primal state of being. Most of my materials come from our natural world, usually from something which was once alive (plant or animal) and which in a sense is embedded with memory and familiarity. "I am constantly trying to figure out new ways to suggest what is beyond the physical using destructive processes with my materials." Do you ever watch people struggle with the desire to touch your work and not knowing if they’re allowed? I love seeing that reaction, personally. Other than that, yes, my woven work really yearns to be touched. 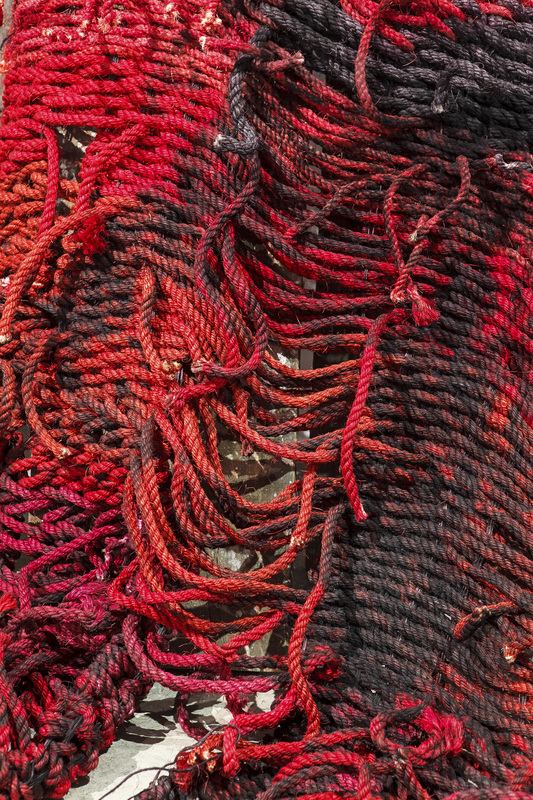 We often think of fiber as a medium to touch because of its utilitarian properties. Textiles are used to keep us warm as clothing or blankets, or as towels to dry our bodies. Cloth is essentially made for the body, so I can understand this urgency to touch my work. You often work with woven knotted, heavy ropes. What attracts you to this material in particular? Ultimately the “heaviness” of the rope attracts me. The weight of gravity that pulls down on the ropes resembles the heaviness of our bodies as the woven ropes slump toward the ground. 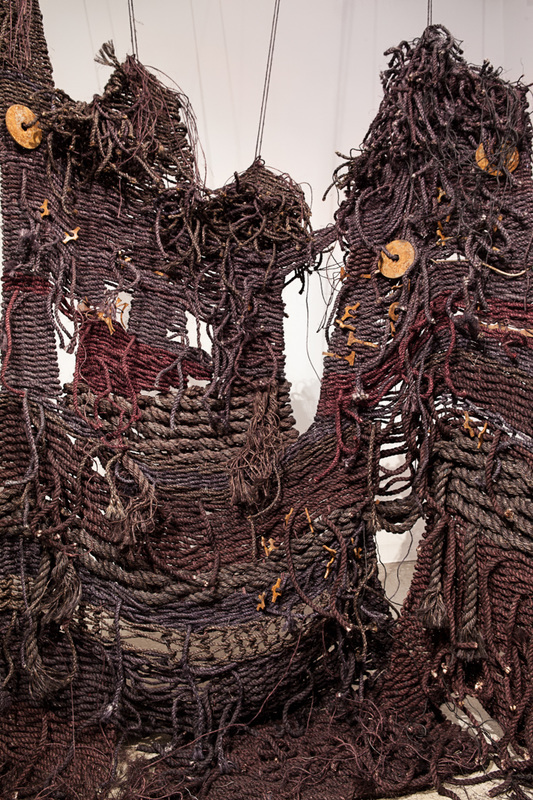 Like a body, my rope weavings are visceral in their composition; they are comprised of fibrous “veins”—an interconnection of ropes—that make up its verticality. Biomorphic and organic in form, they remind us of who we are in regards to our impermanent bodies. How have your material interests changed over the course of your academic study? What has influenced the most drastic change in your process/method of working? 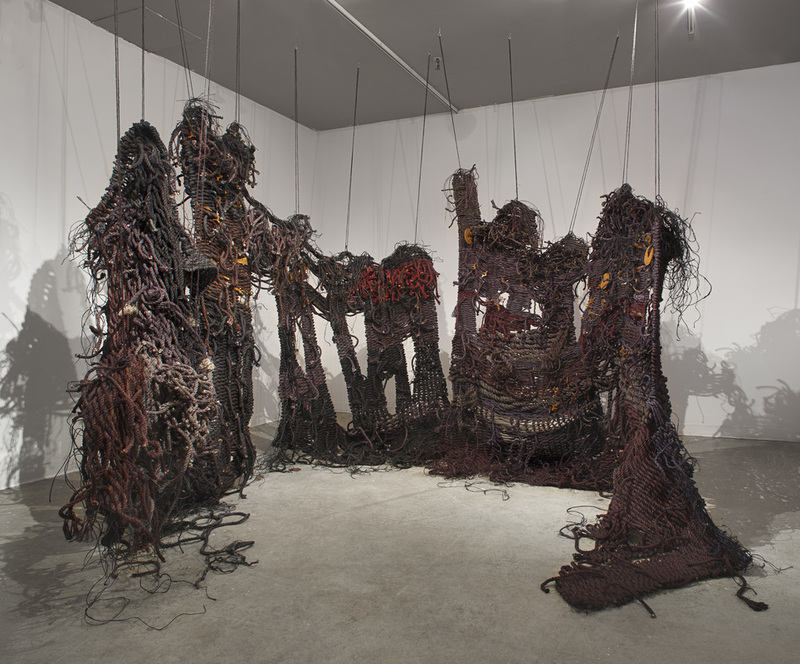 When I started making installation work, I was using crude materials such as cardboard, spackle, plaster and chicken wire. I worked directly on the wall, “excavating” beyond the surface and by cutting into it, and then burying runny materials inside, as if the wall was bursting open or oozing out. What is the best piece of advice you can give to artists working in large-scale installation? It is a difficult medium to work in considering the space and resources issues. To just go for it. Dream big. Large-scale installation can be quite intimidating. You must consider the site-specificity of the space you are installing in as well as the gallery’s rules or guidelines. Can you adhere materials to the wall or hang stuff from the ceiling? Is there a limitation on materials you can use (e.g. food, animal, hair, etc.)? Cost and resources are tricky if the installation requires expensive materials, although many artists create large installations with everyday/recycled materials such as paper plates, plastic cups, etc. You don’t have to spend a lot of money if you have a big vision. If your materials are quite pricey consider a project grant that might assist in lowering or paying for the costs. While some of your past work has figural elements (i.e. plaster hands and faces) most of it has more recently become abstracted. Yet your pieces often retain a sense of humanness. That is, there is something very corporeal about your work that invokes a kind of loneliness as most of the materials are in a state of decay. Can you describe the relationship between your practice and the process or nature of decay? I am constantly trying to figure out new ways to suggest what is beyond the physical using destructive processes with my materials. When I started making installation work in 2008, it began with an idea that I could literally cut into the wall and pull out all of the emotions from the space, as if those emotions were tangible. It became very performative and more about the action and process of making the work. It was actually very emotional and vulnerable work. Formally, I always compared that method of making to drawing—with the cutting and pulling open of the wall thought of as “mark-making”. Now my work has become more three-dimensional, not completely relying on the space it’s in. The process is still very intuitive and raw, although I am using more traditional modes of making (e.g. weaving and ceramics). I often build up my structure (whether woven or clay), then destruct parts of it. The scale of most of my work is important because of its relation to the size of the body. The viewer can confront and connect with my work on a very visceral and intimate level. My woven installation What Remains of the Ephemeral? was installed outdoors during the winter, allowing the elements to affect the work. The snow slowly built up, devouring the bottom of the woven structure, and also settled on top of the chain that held the weaving up. The chain began to rust and the dye began to run as the weather warmed up and the rain fell. The work shows how nature and time transform the physical. Also, the need to install my work amidst uncontrollable conditions such as weather is a way for my work to suggest the nature of decay. "Ultimately the “heaviness” of the rope attracts me. The weight of gravity that pulls down on the ropes resembles the heaviness of our bodies as the woven ropes slump toward the ground. " You also have an online jewelry and textiles shop. How does your work in jewelry/textiles inform your art practice (or vice versa)? They are very interconnected. I feel as though my jewelry and artwork both contain a sort of energy, although one can be worn and one cannot. In a way, making jewelry has helped me become more restrained and detail-oriented, which has really bled through into my new art work. Creating jewelry has been an intimate experience for me, as it is more of an everyday piece that a person can wear on their body. There’s also something to be said about how much skill, patience and craft goes into a fine piece of jewelry. I have so much respect for that. Jewelry can also be worn anywhere, anytime and is so accessible. My art work is generally always limited to the gallery or space it’s installed in. So in a sense, my jewelry is like traveling art. "The work shows how nature and time transform the physical. Also, the need to install my work amidst uncontrollable conditions such as weather is a way for my work to suggest the nature of decay." It is romantic! Working on a weaving loom is so elemental. You are essentially making cloth by the crossing of threads. So in a way, every time I sit at a loom I feel as though I am transported to an ancient time. Yes, I do give workshops. Usually from my studio space or as a guest teacher. One day I would love to open up my own weaving workshop space and create a community to share ideas and resources. What’s next for you? What projects are looming in the distance? Currently I’m working on a solo exhibition at The Art Gallery of Mississauga, Sung From the Mouth of Cumae. It is inspired by the Cumaean Sibyl, a Greek oracle who was said to have sung prophecies from the mouth of a cave. 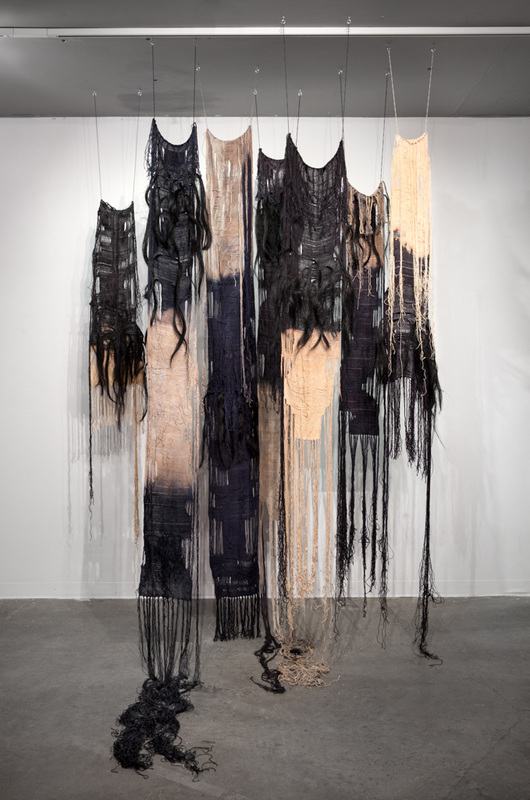 The exhibition will consist of a series of five ten-feet-tall weavings made from black linen and raffia and a large-scale ceramic pillar with sound emanating from it. The sound is comprised of layers and fragments of my voice, evoking the Sibyl as she sang her prophecies. The weavings will be bleached and then dyed with rusty objects that I have found during my travels. As for my jewelry, I’m conjuring up my next collection which will consist of hand-casted metal and handwoven/hand-dyed fiber. I’m really excited about it. Stay tuned for a video tour of Mary Grisey's studio in our Weekly Section. Check out more of her work on her website www.marygrisey.com and follow her on Instagram @marygrisey. Definitely take a look at her META jewelry line as well!